Two hungry T. Rex Dinosaurs? 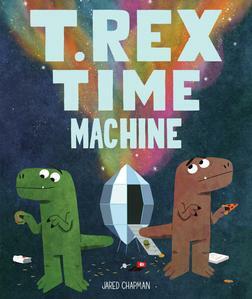 T. Rex Time Machine by author/illustrator Jared Chapman is a hilarious picture book that will leave you hungry for french fries and donuts--and more dinosaur adventures! Jared Chapman’s illustrations are eye-catching and the humor is for children and adult readers alike. Some of Chpaman’s clients include Walt Disney Television Animation, Nick Jr., Nike, McSweeney’s, Hallmark, Jib Jab, and Mudpuppy.